Designed with both leisure and business travelers in mind, the stylish modern designs and upgraded amenities of Best Western Plus hotels provide ample space and amenities for both work and leisure. 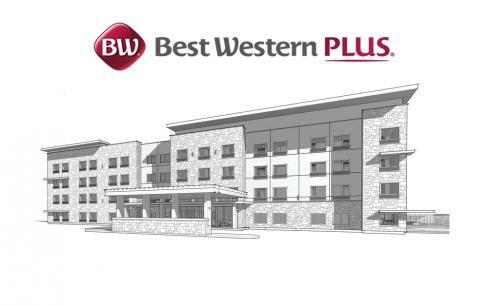 Once complete, this four-story, wood-framed building will include exterior features comprised of EIFS (Exterior Insulation and Finish System), stone veneer and an EPDM (rubber membrane roof) roof system. Before construction on the hotel can begin, J&S Construction must first remove more than 40,000 cubic yards of spoils from the site. The two sides of the property will utilize a Sierra Slope® retaining wall system. This system provides an economic and aesthetic alternative to conventional concrete retaining walls while maximizing developable land, creating usable land in undeveloped areas and enhancing property values. The 3,833 square-foot lobby will feature a variety of communal areas including a meeting room, breakfast and community area, service counter and buffet, a business center, media center and fitness room overlooking the private, fenced in exterior pool. Additional amenities will include vending areas, guest laundry, meeting room, restaurant and coffee shop, lounge and sundry area. A portion of the second floor corridor will overlook part of the first floor lobby. adhere to the brand’s architectural guidelines.